The Butia capitata or Pindo Palm is a familiar and much loved hardy feather leaved palm from Brazil that will tolerate extremely low temperatures when older. 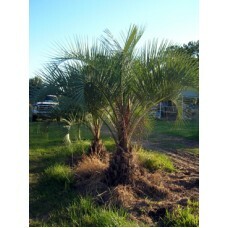 The Pindo Palm has blue-green recurved leaves a stout trunk and deliciously edible round yellow fruit. The Butia capitata or Pindo Palm will succeed in most climates from temperate to tropical but will really come into its own in a temperate zone. One of the few truly Cold Hardy feather palms. 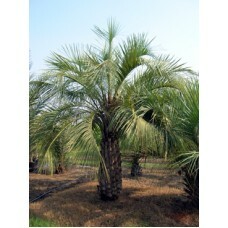 The Pindo palm is rated for Zone 8 and can tolerate a hard frost with temperatures as low as 10 degrees.